It’s a famine or a feast these days. A busy month with yet another reading, this time in the fabulous Books Upstairs in Dublin’s D’Olier Street. I’ll be reading with two wonderfully talented writers, Lindsay J Sedgwick and Carolann Copland, this Sunday, April 22nd. 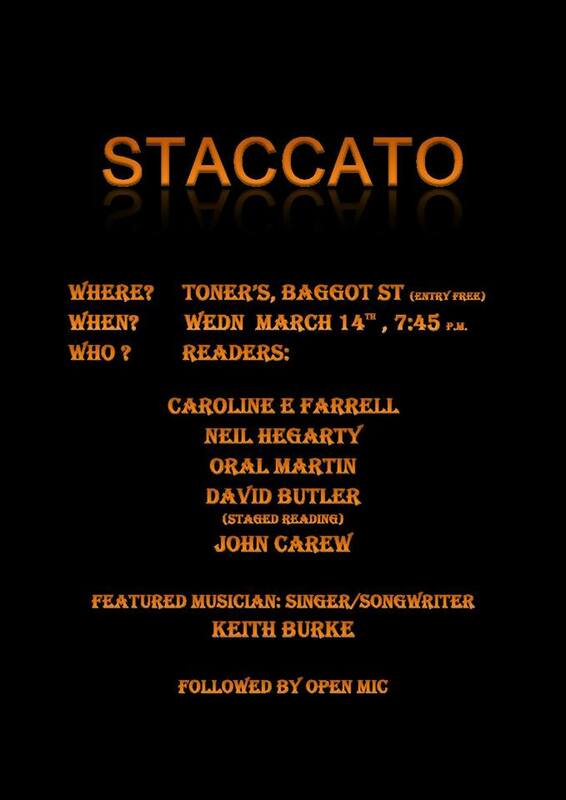 I was delighted to be invited to read at Staccato Spoken Night, with some wonderful writers, poets, musicians, actors and storytellers. The event is held in Toner’s Pub, Baggot Street, Dublin on the second Wednesday evening of every month. Well worth a visit, and great craic!